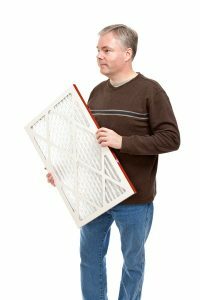 Everything You Need to Know About Your Air Filter | Clean Air Act Inc.
Air filters are rated by their Minimum Efficiency Reporting Value, or MERV, rating. The range goes from 1 to 16. So that means you need a MERV of 16 to give yourself the best air quality in your home, right? Well, not quite. The highest MERV rated air filters are required for inpatient care rooms, surgical rooms, and other places where airborne contaminants of any kind are a danger. The reason you shouldn’t use these in your home is that they’re so tightly woven that they actually restrict airflow—thus costing you more money in the long run. A range from 5 to 8 is perfect for the majority of homeowners, but those who have reason to believe they need a higher rating should go as high as 12. Anything above that is inefficient. An air filter is going to collect contaminants and dirt over time, so it won’t last you forever. If you don’t change it, it can have negative effects on your system (more on that later). Those who live alone with no pets or allergies are safe to change their filter as late as 12 months. The average family without pets should change it as soon as every 3 months. With one cat or dog in the home, their pet dander will contribute to a clogged filter much faster, so you should expect to change it about every two months. With more than one pet, and especially if anyone in the family has allergies, then you should expect to change it as little as every 30 days. Neglecting to change your air filter can cause a number of problems that share symptoms with much larger problems. For example, short-cycling. Short-cycling is when your AC turns on and off too quickly, and is usually caused by an air conditioner that’s too powerful for the home it was installed in. An AC that’s too large for the home is more common than you’d think, and the only solution is to replace the entire air conditioner. But in reality, if the short-cycling is caused by a dirty air filter, it can be easily fixed by changing out that filter. That’s why before you call in for air conditioning repairs in Clackamas, OR, you’ll want to always take a look at the air filter to make sure that it hasn’t become clogged. Dirty air filters can also share the same symptoms of refrigerant leaks, an overheated system, and more. Did you change your air filter? And you’re still having problems? Contact The Clean Air Act and ask for Sydni, our Office Extraordinaire, to schedule your next appointment! We will take care of you from there!